A few months ago, we got to host the lovely Anzula Luxury Fibers Trunk Show at the shop. 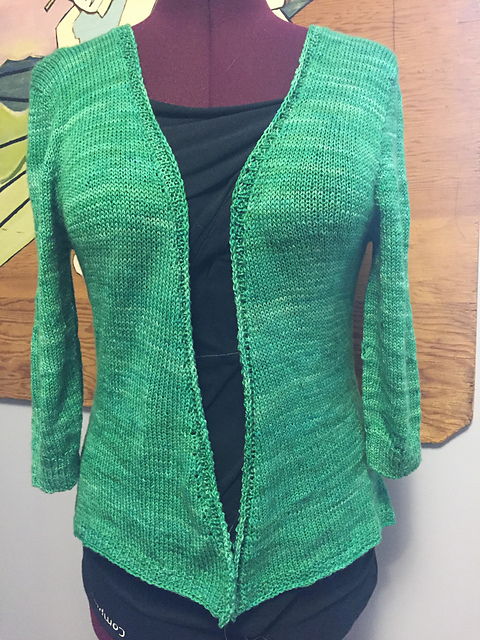 We all predictably drooled over the yarn, but Pia and I drooled in particular over one of the sample sweaters that came along with the show, the Sara Lace Cardigan. We both took temporary leave of our senses (I blame all the cashmere) and bought enough yarn to make the sweater. Pia finished her lovely bright pink one a few weeks ago, and I? 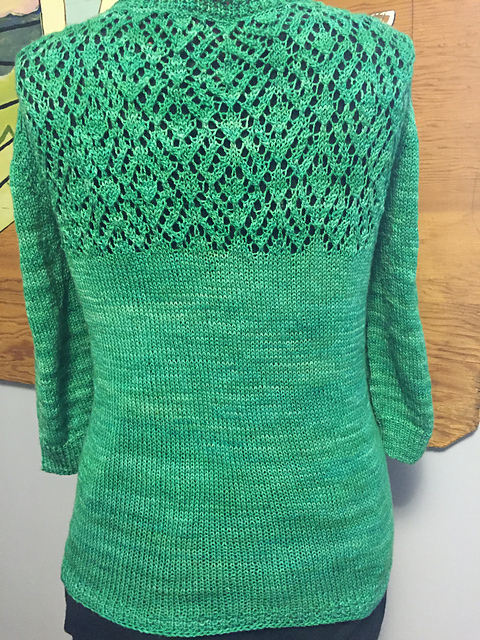 I just finished my pretty bright green one today. It’s a simple sort of pattern really, of the no-closures type I’ve been so fond of lately. It’s meant to be worn as a light layer, hanging open gently at the front and just covering the arms and shoulders against a chill. Knit up in the very aptly-named Anzula Cloud yarn, it’s as soft and light as a summer breeze. It’s perfect for warding off overenthusiastic air conditioning while being thin enough to stuff in a bag or purse without taking up a ton of room. The color gives it a bright summery feel, and the pop of lace on the back yoke keeps it from being too plain. I really love the way it turned out, and am grateful I managed to finish it before the warm weather has taken its last gasp. Probably feels as good as it looks. Reminds me of a pattern that might have been popular during WWII–not enough yarn?–no problem make the back yoke lacy!